The theme of today's review is "unexpected quality." Prior to their "New 52" reboot, DC's Batman family of books was fairly mediocre. Grant Morrison was still in the middle of his meandering story about Damian Wayne, and all the other Bat-books... were certainly still being published. The high point of the time was Detective Comics with "The Black Mirror," so it's no surprise its author was tapped to take over the main Batman book after the reboot, or that his next story would be so damn good! "The Court of Owls" achieved that rarest of feats: it added a major retcon to the universe that makes sense, fits seamlessly, causes fundamental changes, and yet was mostly approved of by the fans. The premise is this: the Court of Owls is a secret society that's secretly operated in Gotham City for centuries, with some of the wealthiest families as its leaders, and the fearsome Talon as their enforcers. 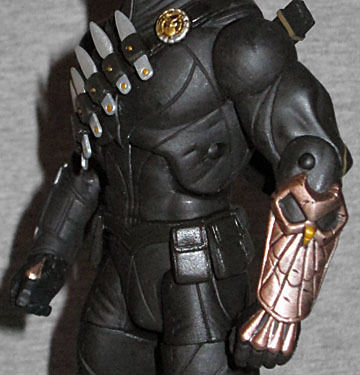 The Talon is wearing a fancy black costume with gold accents. His head is fully concealed beneath a loose hood that bunches around his neck, then tapers to a point in the back and has gold (metal?) strips on the face and nose that give him a strignine appearance. The eyes are hidden behind a pair of silver-rimmed goggles with orange lenses. The figure was sculpted by Jonathan Matthews, who's done a lot of DC Direct stuff and always makes it look good. There may not be a ton of color or crazy details on the costume, but there are a lot of thin panel lines that need to line up between the legs and torso, a bandolier of knives strapped to his chest (with a small, ornate owl badge at the top near his shoulder), brass knuckles built into his gloves, and kneepads that are shaped like owl heads. Like Batman, he has a utility belt. Unlike Batman, he has a bracer with throwing spikes on his right arm, and a bronze plate of armor on his left arm that looks like a stylized owl. This entire series (comprising Batman, Talon, Nightwing and Riddler) is based on the artwork of Greg Capullo, and the sculpt duplicates it perfectly. And for once, the articulation doesn't ruin an otherwise decent toy - not at all! Talon doesn't have a neck joint, but by the time we're done listing the rest, you won't care. He has swivel/hinge shoulders, swivel biceps, hinged elbows, swivel/hinge wrists, a hinged torso, a waist, H-hips, swivel thighs, double-hinged knees, swivel shins, and swivel/hinge ankles. Holy crap! That's like the articulation you'd find on a real toy! 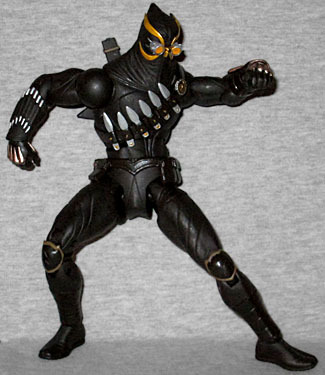 Hasbro or Mattel could release a toy that moved like this, and you'd be fine with it - and this is from DC Direct, the company that was only overshadowed by McFarlane Toys in the "we can't figure out that our customers want joints" department! Of course, since they're spending so much money on the articulation, DCD had to skimp on the accessories. Talon only comes with a little knife that fits in his hand. Oh, and a second knife that can be stored in the sheath on his right hip. Or held in his hand. Plus there are the two short swords in the scabbards on his back - yeah, those are separate pieces, too. And yeah, they can be held in either hand. But that's all. Except for the fact that all six throwing knives in his bandolier can be removed! Sweet freaky Moses! This thing is amazing! And then... on top of all that... he also includes an in-scale Court of Owls mask! All the members of the Court wear these to conceal their identities, and DC has even given out wearable ones in the past (Rustin tried to get me one at SDCC, but wasn't able to), but this one is sized for action figures. The interior is perfectly smooth, and there's no way to attach it to any figures by itself, but it's still a fun extra. The Court of Owls and their Talons are great additions to Batman's Rogues Gallery. And this is an excellent toy of him. We got to see a whole bunch of Talons through the course of the story, all designed by Capullo; and this toy is so good, we'd love to see DC Direct make them all.